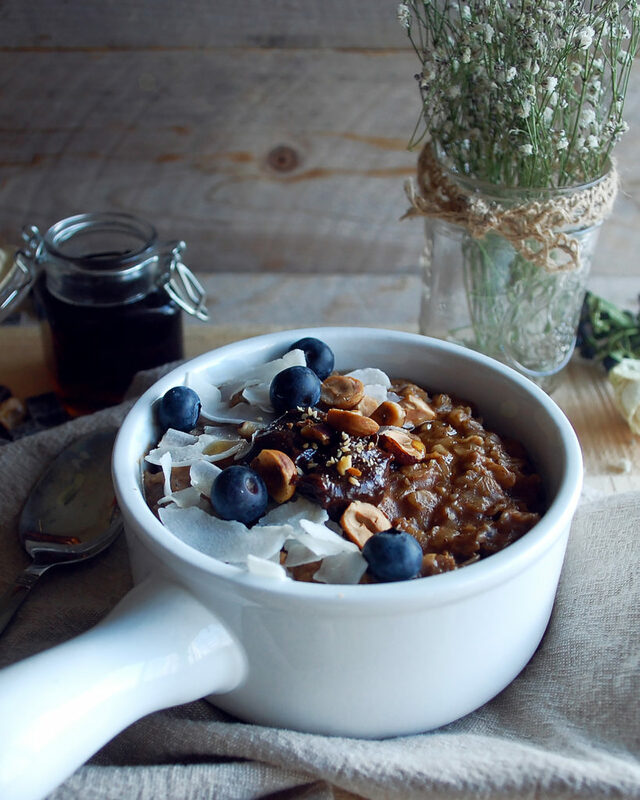 A sweet and satisfying breakfast, that happens to be healthy too, is the best way to start the day. I’ve always been a huge fan of Nutella. I can honestly eat it by the spoonful straight out of the jar. My last post was a recipe for these amazing little shortbread cookie sandwiches, which I slathered with Nutella on the inside. While making the cookie sandwiches I began to crave a healthier version of the creamy chocolatey spread, something I would want to eat more often than on a special occasion. So, I decided to make my own. I am all about making foods yourself that you might normally buy at the grocery store…granola, dressings, condiments, etc. At the top of that list is nut butters. I love making my own nut butters because in their raw form, minimally processed and with few, simple ingredients, nut butters are extremely nutritious for you. Most products at the grocery store have so many other ingredients added that make all the benefits of the healthy spread sort of cancel out. 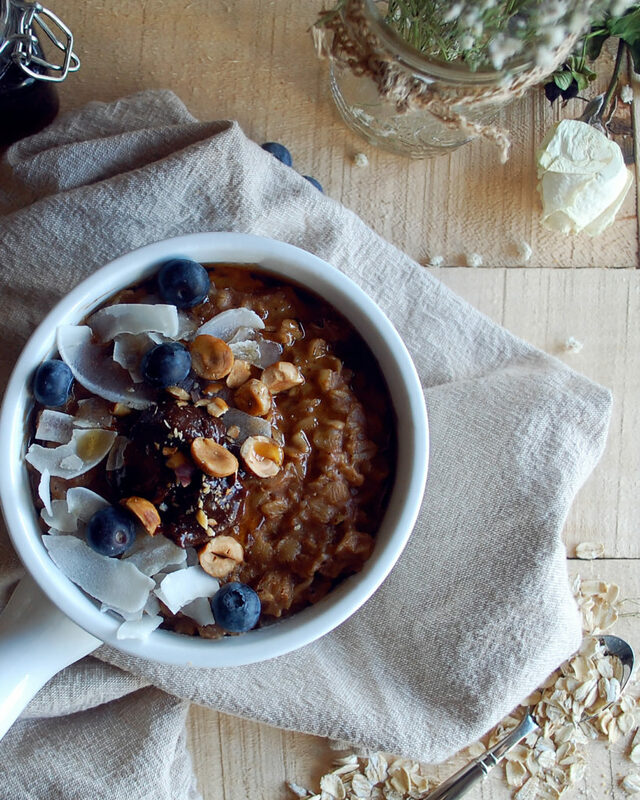 This chocolate hazelnut butter gives you the best of both worlds, healthy and delicious. I use high quality dark chocolate, roasted hazelnuts, and pure maple syrup to sweeten it. It’s so simple and tastes so much more “real” than most sugared up versions at the store. There’s also something really satisfying about making your own nut butters. You can mix and match any nut with any flavor and create your own unique spread. I would suggest (while you’re going through the effort of pulling out the food processor and making it), to make a double or triple batch of the recipe. That way, you can use some in the oatmeal and have some for snacking on later. 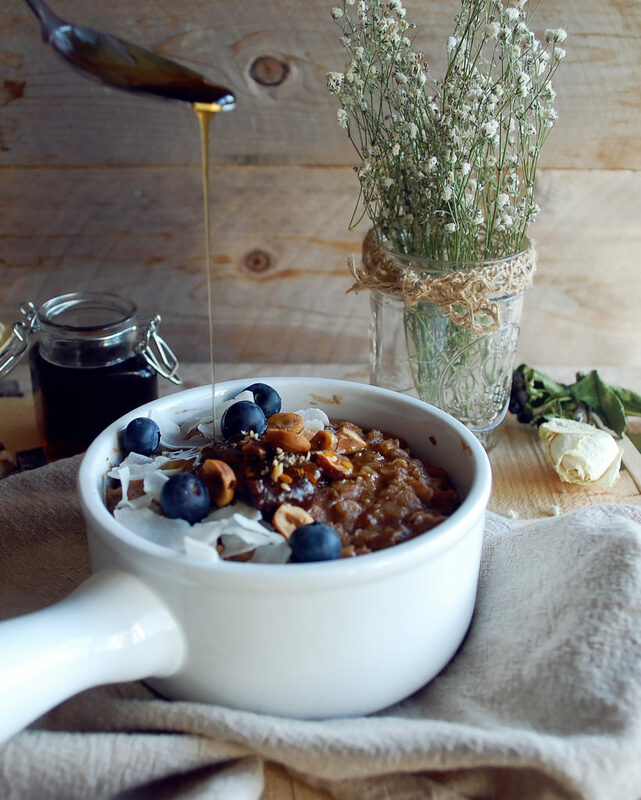 And for a bit about the oatmeal…it’s hearty, creamy, and topped with a luxurious drizzle of maple syrup. Mornings don’t get much better than that. Enjoy! In a food processor, pulse the hazelnuts until smooth. Add in the chocolate, maple syrup, and a pinch of salt. If the butter is not coming together, add small amounts of water as needed, just enough to create a smooth, buttery paste. Spoon the mixture into a bowl and set aside until ready to use. Bring the milk to a boil (watch it carefully so it does not overflow), and stir in the oats. Simmer until the liquid has absorbed and the oats are tender, stirring often. Stir in the homemade chocolate hazelnut butter, vanilla extract, and a pinch of salt. 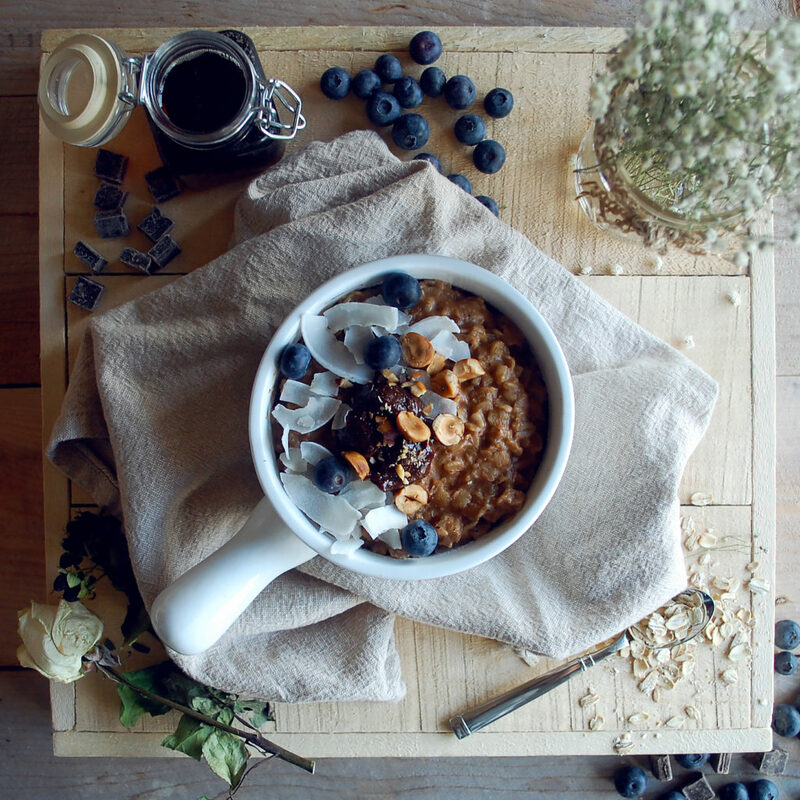 Adjust the oatmeal to your desired consistency by using more milk if too thick or simmering longer if too runny. 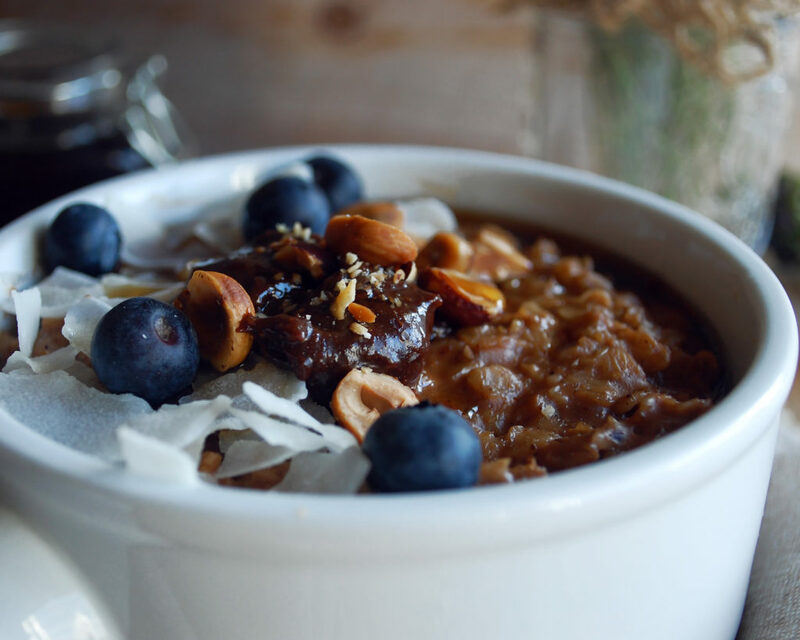 Serve the oatmeal with a dollop of the homemade chocolate hazelnut butter, fresh blueberries, coconut flakes, roasted hazelnuts, and a generous drizzle of maple syrup. 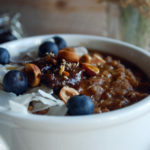 I’m eating oatmeal right now and it is NOTHING like this! I’m almost in tears because I want some chocolate hazelnut butter mixed in :). Love it! Thanks Kelsie!! 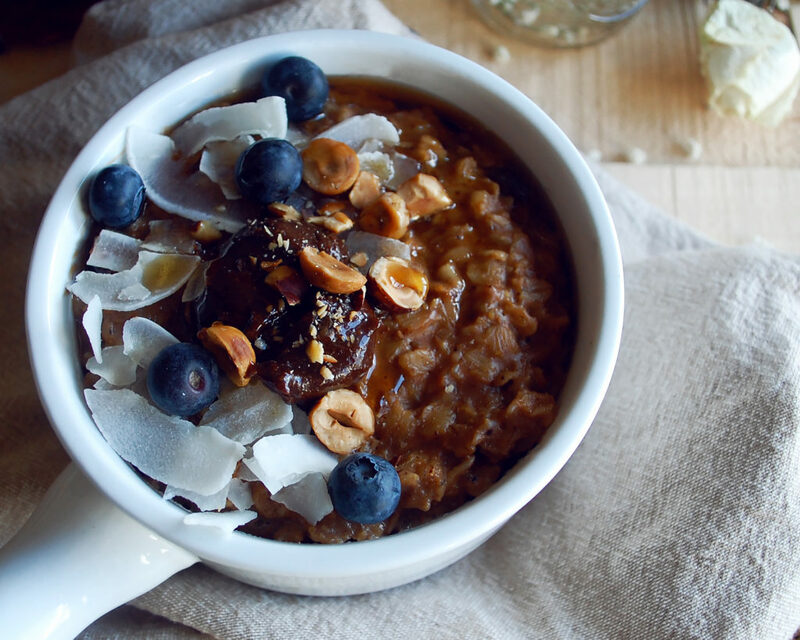 I know, any day I just make regular oatmeal I am craving something like this! So tasty but also pretty healthy!